Have you ever had one of those mornings when everything seems to be going right? You’ve had a good night’s sleep, your favorite outfit is clean, and your hair has miraculously fallen perfectly into place. Knowing that you’re looking good, you stroll confidently into work and greet your co-worker with a cheery hello. As you prepare to start your awesome day your co-worker turns to you and says, “Hey– are you OK? You look like you’re coming down with something.” And — BAM! In the blink of an eye the Debbie Downer lurking in your office has sucked your early morning buzz out of your body and flushed it down the toilet. While most people view the dance floor as a place to get down to some great music, others see it as the perfect locale to talk about all of the problems currently going on in their personal lives. The social dance floor becomes an extension of their therapist’s couch and you unwittingly become a discount Dr. Phil because you’ve accepted their invitation to dance. Over the years I have had dance partners tell me about problems at work, problems in their marriage, problems with “the law”, or even about problems with their bowel movements during the four minutes we’ve shared together on the dance floor. Memorably, while dancing at an outdoor public event last summer one man pulled up his shirt to show me the scar on his stomach from where his “old lady” had “accidentally” stabbed him with a fork during an argument. WARNING. If you are dancing with someone who starts throwing out words like “hemorrhoid,” “alimony,” or “pregnancy test,” feel free to break away from your partner to do the longest solo dance pattern of your life and then, run far, far away. Not to be unkind, but many of us look to the dance floor as a place to temporarily escape our own problems, rather than as a place to discuss someone else’s. Dance Floor Downer #2: “THE TRANSFORMER,” AKA, — The Dance Partner Who “Morphs” Into Your New Dance Instructor By far –The Transformer is the most lethal type of Downer that you will encounter on the social dance floor. 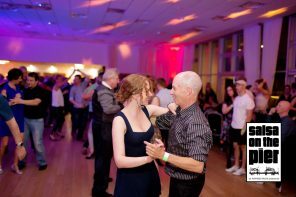 It is one thing to be given instructions by your real dance teacher during a real dance class, but it is an altogether different experience to be “taught” by a random dance partner during a social dancing event. A few weeks ago I asked a gentleman to dance during one of my favorite Socials. I’ve danced with this man on many prior occasions and have found him to be a good partner in the past. The man accepted my invitation, and, (from my perspective), we had a very enjoyable dance. However, as soon as the song ended this man took me by the elbow and escorted me off of the floor. Before I could thank him for the dance he proceeded to tell me everything I could have done better while we were dancing. At the end of this long lecture I felt so deflated that I decided to leave the Social and go home before I could completely stink up the dance floor. Shortly after returning home I noticed that The Transformer had sent me a text requesting that I call him for additional tips on improving my dance technique. I declined to call him, but upon checking my email the next morning I discovered that he had also sent me an instructional dance video from YouTube with the suggestion that I watch it. OMG. WARNING. If you find that your self-confidence is being crushed by the harsh words of a particular dance partner, please re-evaluate whether you need to dance with this person again. The pure joy that comes from dancing should never be diminished by someone else’s judgment on the social dance floor. **If you feel that you MUST give some type of instruction to a dance partner, please give it in the kindest way possible and only give it ONE TIME. There is definitely a difference between receiving a helpful tip versus receiving a scolding on the dance floor. There always seem to be a few of these gloomy, annoying people at every Latin dance event I attend. You probably know the type. They are the people who complain about the music: “Why aren’t they playing more Mambo/ChaChaCha /Bachata/whatever…” Or, they complain about the other dancers: “There aren’t many elite level dancers here …” Or, they complain about the dance floor, the temperature of the room, or generally anything and everything else they can think of to complain about at the event. They are generally dressed to impress and spend most of their time standing together in the corner of the room. What is fascinating about the “Wanna-Be” posse is that most of its members don’t actually dance very well, but have clearly bought into some kind of delusion regarding their greatness. 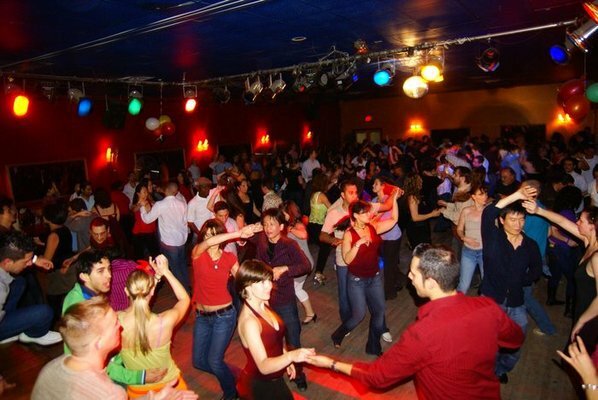 Most of these people are beginner to mid-level dancers who would actually have a great time on the dance floor if they would stop pretending to be something they are not. WARNING. Just because you took a class that one time with some lady who danced with Eddie Torres for 5 minutes in the 90’s does not make you the Queen or King of the dance floor. If you really think that you’re too good for a certain Social, please do everyone a favor and stay away. Otherwise, come to the dance floor with a smile, ready to dance and to have a good time with everybody in the room. 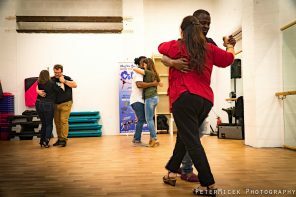 From time to time, you may find yourself dancing with someone who seems to have no idea that you’d prefer to keep your arms connected to your shoulders, or that you’d like to avoid being stepped on, elbowed in the face, or hit in the groin. Now—don’t get me wrong. If you’ve been dancing for a while you’ve probably been both the perpetrator and the victim of a “dance floor accident.” While these kinds of accidents happen every once in a while, when you are dancing with The Safety Dunce your chances of having an encounter with pain becomes almost a certainty. This person is not a nervous klutz; rather this person doesn’t have much interest or regard for the safety of his/her dance partner. The male Safety Dunce enjoys “strutting his stuff” on the dance floor and typically uses his dance partner as the vehicle for his attention seeking display. These are the Leads that will spin a beginner Follow multiple times, regardless of her ability to maintain her balance. Or, these are the Leads that will steer their Follow right into the path of another dancing couple because they are too busy showing off their moves to protect their partner from imminent bodily harm. The female of this species is just as deadly, throwing up her arms in unnecessary styling moves, seemingly unaware that her partner’s nose is in danger of being a casualty of her random contortions. The female Safety Dunce may also take a stealthier approach by not visibly doing anything dangerous, but will choose to place 90% of her body weight on her partner, forcing him to painfully drag her around the dance floor. WARNING. If you find yourself dancing with a Safety Dunce this is one of the rare occasions when it is acceptable to stop the dance before the song is over. Your personal safety should always come first. While there are definitely men who fit into this category, The Lifetime Movie is usually an attractive female dancer who accidentally reveals a big secret during a Latin dance event. The camouflage surrounding the secret can take many different forms, but, at its core, the secret is always the same: that the sweet woman smiling at you across the dance floor is actually BAT S**T CRAZY. Usually this secret comes out upon the Lifetime Movie’s break-up with her salsa dancing ex-boyfriend. While this woman is clearly distraught and should have stayed home, she has decided to come to the Social to show everyone her CRAZY. The Lifetime Movie will make an attempt to talk with her Ex, who will completely blow her off. At this point, depending on how deep the CRAZY really is, The Lifetime Movie will either begin to feverishly flirt with another guy to get the attention of her Ex, or will leave the Social in a huff, briefly pausing in the parking lot to slash her Ex’s tires. WARNING. Stay as far away from the Lifetime Movie as possible when she starts her migration to the corner. If you are anywhere near this lady when she begins to blow you will be sucked into her emotional vortex even if you barely know this woman. Once this happens your night of carefree dancing will be over. The typical “911” is usually someone who behaves fairly normally until he/she has had a little too much to drink. Once this person has been “over-served” everyone on the dance floor should be more than a little afraid. When you are dancing with a 911 an ordinary Bachata can turn into the X-rated bump-n-grind of your nightmares, or a sensual salsa can become a wrestling match worthy of the WWE. There are also “911s” who haven’t had a drop to drink, but just like to get straight freaky on the dance floor. When I first started dancing there was a young man who was notorious for trying his “signature move” on every lady who had the misfortune to dance with him. This 911 would begin the dance normally, but somewhere during the middle of the song would maneuver his partner into a back to back position so that he could vigorously and rapidly rub his buttocks against hers for a solid eight count. All I can say about this experience is – YUCK. I’ve had male friends tell me about freaky female 911s who have licked the sweat off of their faces or have attempted to do some sort of dog in heat gyration on their leg in the midst of a Bachata. While this kind of behavior may not always be unwelcome to certain people, for others, this is the kind of dance that makes them want to send out an SOS. WARNING. If you want to have a successful night of dancing, it’s probably not a good idea to drink too much before you hit the dance floor. And – if you are a straight freak, just make sure that your partner is into whatever it is you like to do, or else you might get hurt or possibly arrested. While it is impossible to completely escape all of the above-mentioned Downers, vigilance and early detection will allow you to reduce the frequency of these buzz-killing encounters on the dance floor. Good luck and happy dancing everyone! “dog in heat gyration on their leg in the midst of a Bachata. ” – LOL, this exact thing has happened to me.